DUMBARTON gained a morale-boosting win over Premiership top six side Partick Thistle on sunlit evening at the Dumbarton Football Stadium. DUMBARTON gained a morale-boosting win over Premiership top six side Partick Thistle on sunlit evening at the Dumbarton Football Stadium in front of a 680-strong crowd. With four trialists on the team sheet — three of them on the bench — Sons started the game brightly. On 11 minutes the home side took the lead. A decent pass from Tom Walsh was well converted by Christian Nade, who crashed the ball into the net for 1-0 (pictured). Kyle Prior came on for Grant Gallagher on 37 minutes, after the no.6 went down with a knee knock. 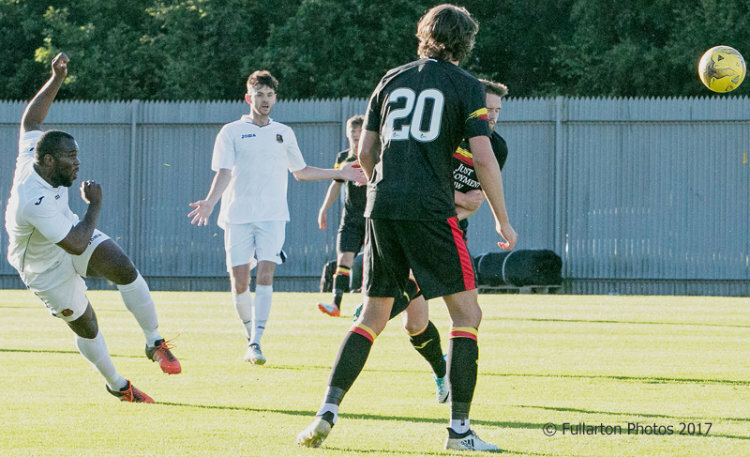 After half-time Calum Gallagher came on for Mark Stewart as Dumbarton looked to solidify their lead. The visitors continued to apply pressure as the half progressed. Sons mixed it from the bench, brining on two trialists for David Smith and Christian Nade, and moving Craig Barr to right back. There was another change for the home side on 70 minutes, when the impressive Tom Walsh took to the bench, making way for another trialist. On 82 minutes Dumbarton clinched the game, as trialist no.15 finished from close range to start Sons home campaign off with a pleasing win.